Kym and I were discussing the other day that things are feeling a little slow in the blog world. Not a lot of posts right now and stuff like that. I even said the sentence I dread most: I have nothing to blog about tomorrow. And then I thought, wait. When I have nothing to talk about what can I always talk about? Books. Right now in particular I can talk about books I have been reading for Summer Book Bingo. Because progress. I can’t figure out a square that could count for so it’s just a book I’ve finished. 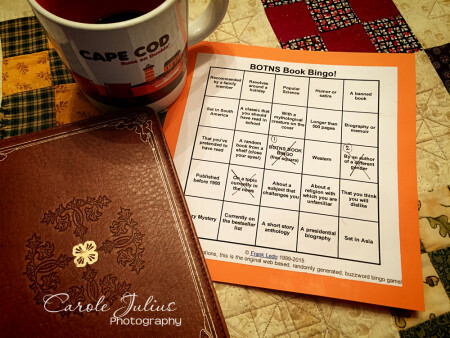 I shouldn’t have any issues making at least a bingo or two so I’m not really worried about that and the book was so wonderful and I’d been waiting so long that I wouldn’t have wanted to wait until the end of the summer anyway. I am currently reading (well, listening) to Mink River by Brian Doyle and I’m going to use the square that says With a Mythological Creature on the Cover. I realize that a crow, which is what is on the cover of this book, isn’t technically a mythological creature. However, in this particular book and in consideration of this particular crow, mythological is definitely a word I would use. Plus, it’s my bingo card and it’s my rules. I am also currently reading Doc by Mary Doria Russell and that will be for the Western Square. Pretty straight up and self-explanatory there. I have plans for the other squares, including To Kill A Mockingbird for the banned book square, A Tale of Two Cities for the book I have pretended to have read square, Double Fudge Brownie Murder for the cozy mystery square and Pioneer Girl: The Annotated Autobiography for the biography/memoir square. For someone who didn’t have anything to say today I guess I managed to say a lot. Just finished Boston Girl. It was really good. Well, I need to get reading! You are so good about trying different authors and genres. I am reading Americanah, which is set in the USA and Africa! It’s quite compelling! Also, recently finished The Paying Guests, a veryndifferent sort of suspense novel. Thanks for sharing your recent reading. I’ve printed a card, but I doubt it’ll be a winner by the end of summer! I’m having fun with the challenges, though. Thanks for sharing your reviews! Working my way through a stack of library books, including a recent Dennis Lehane. Used to read his mystery/action/detective books set in Boston until they turned very dark. Then I realized retroactively that they’re ALL dark. Give me a McCall Smith any day. Great idea for a post, Carole! (I’m totally stealing it for next week. . . ) I just finished Mink River. It might be my new favorite-book-of-all-time. You have given me a few to add to my TBR pile. It just keeps growing and growing! !